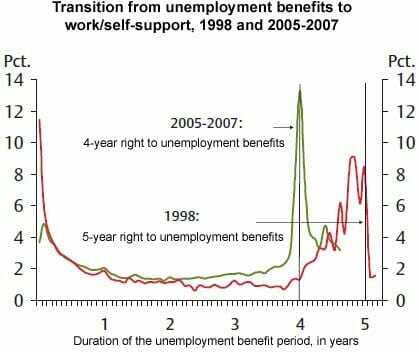 > There are many people who simply stay on unemployment as long as they can. *That said with the recognition that if you're doing the same job forever you likely get ossified, but that's not the case for me, I've held an array of jobs in that 30 years from Tech support to coding to regression test design... and in my last job I picked up Oracle SQL from total scratch in under 8 weeks to being fully functional. Also, same job, I picked up Robot Basic (Rational Tools, a testing oriented variant of early VB) inside of 4 weeks to the point where I was doing things the 25yos around me had no idea it was even capable of (I know, I asked how to do 'x' -- a likely feature -- was told "dunno", then spotted the actual means to do it on my own looking through the language docs). I knew what to expect from 30 years of experience, so when I saw the language element I immediately recognized its purpose, something these younger guys hadn't figured out in over a year of usage. Further, overlooking what they had supposedly tested, within 2-3 days, I found major crash-straight-to-windows bugs that they had somehow managed to miss in four months of exploratory testing and two months of regression testing. With all due respect to those unemployed who are honestly trying to find a job, the fact remains that the unemployment system is horribly abused. Fifty years ago, I encountered a steel erector who worked six months until he was eligible for unemployment benefits, and then went home to go fishing for six months. He called it "rocking chair insurance". A woman I knew was laid off. I suggested she sign up with a temp agency. We hired temps for vacation or sick relief. The ones who were good and would make a good fit were offered full time jobs. She looked at me with astonishment and said "but I would lose my unemployment benefits!". Virtually every government assistance program is abused. Poor girls find it better to have babies than get a job. Etc, etc. It would be nice if this sort of thing did not happen, but it does, and we have to devise ways to cope with it. Unfortunately, every effort to do so is met with "you terrible person, you want the poor to starve, old ladies to live in the street, etc. etc.". I guess I am a terrible person, as I believe that able bodied people who live off of their fellow man should not be encouraged to do so.